Piazza Erbe is a located in Verona, an italian city, full of history and cultural treasures. 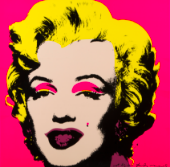 The artwork is signed and has the certificate of authenticity of the artist. This artwork is published on the artist's catalogue Athos Faccincani edited by Deodato Art Gallery. 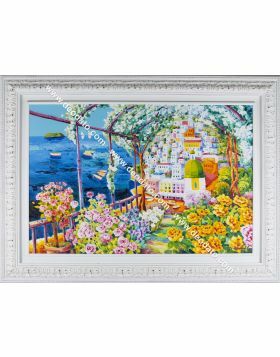 The artwork is signed and has the certificate of authenticity of the artist. This artwork is published on the artist's catalogue Athos Faccincani edited by Deodato Art Gallery. 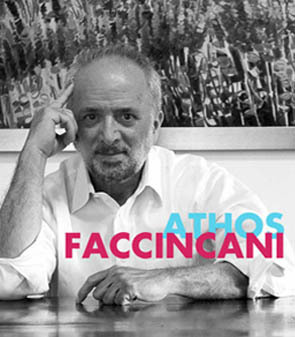 Athos Faccincani was born in 1951 in Peschiera del Garda, Italy. Once he finished the high school, he decided to dedicate himself only to his art. The works of these early years have a dark expressionist style and portray suffering characters. Athos Faccincani visited psychiatric hospitals and prisons in order to be able to better express the pain and anguish of his characters. In the ‘70s he received the nomination of Knight of the Italian Republic. Thanks to his tremendous work exposed in a Resistence’s exhibition (an exhibition about the Italian war Resistance). The president Sandro Pertini himself gave him this honor. 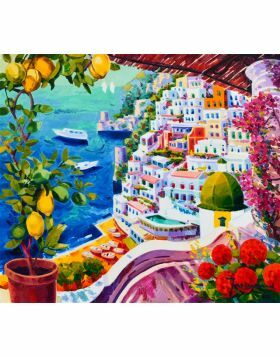 Faccincani lived a period of frustration and confusion after this important event, he decided to quit painting for a year, then he started traveling a lot, especially in south of Italy. When he restarted working, his style and subjects were very different. The influence of the beautiful places that he had visited during his sabbatical year left a mark on his art. No more dark colors, pain and suffering. 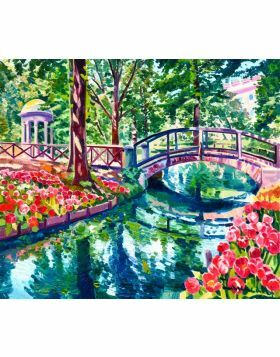 His new style takes something from the impressionist movement, but the most important changes are the new subjects. 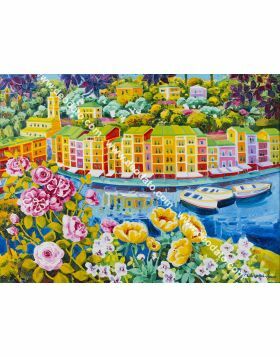 Majestic landscapes, representing mostly the coasts of Italy, showing the beauty of Mediterranean lands. In this new artistic path Faccincani expresses the opposite of his previous works. 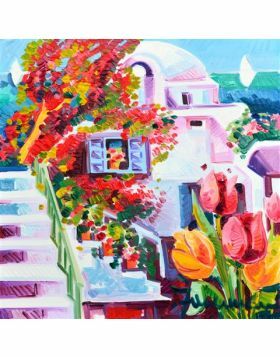 Every canvas has the same guidelines, such as a bright sun in a blue sky, the typical Mediterranean houses and the lush colors of the vegetation. His canvases catch the spectator eyes because of the strength of the landscapes, the brightness of the colors, and for the beauty of the views he describes. 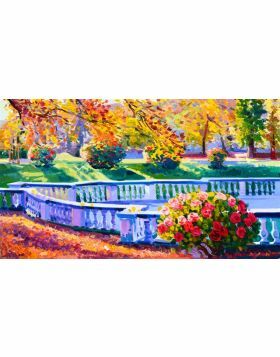 Guastalla's gardens and autumn colors.